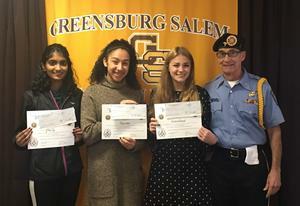 Veterans of Foreign Wars Post 33 member, George Kleckner, presented awards to three juniors for their Voice of Democracy patriotic audio essay submissions focused on this year's theme, "Why My Vote Matters." Jordan Vertacnik, Grace Joy, and Kaley Lazere won 1st ($500), 2nd ($300), and 3rd ($100) places, respectively. Congratulations ladies for your accomplishments!